Back in 2011 I wrote a post entitled ‘QR codes will die soon – Here comes ‘Near Field Communications’ (NFC)”. Well more than three years later, not unlike the great Mark Twain, rumors of the demise of QR codes were greatly exaggerated – by yours truly. While I still feel that QR codes are destined for extinction, there are examples of successful employments using QR codes http://marketingland.com/qr-codes-work-when-done-well-56243 but far too often they are just used as an afterthought and do not suit the media vehicle in which they appear. 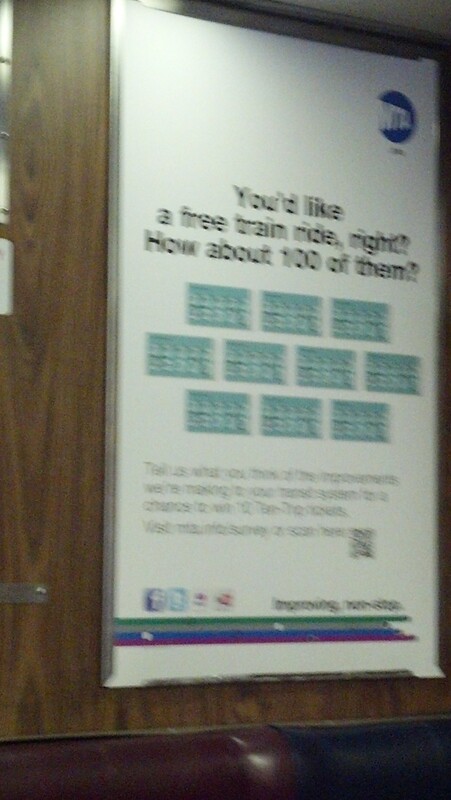 This morning I saw an ad on my commuter train to New York City. It offered a chance to win 100 free train tickets, a prize that caught my eye as at $14.75 per ride with no discount – well you can do the math. I took the photo shown in this post from my seat which was quite close to the area in which the ad appeared. I attempted to access the QR code from my seat without any success. Forget for a moment that the train goes through tunnels on each trip in or out of Manhattan and when one is in the tunnel there is no Internet service so that for some portion of every ride a QR code is – useless. But isn’t it even worse to create what is a somewhat compelling offer and then merely frustrate the potential user by having the size of the QR code so small that unless you are standing directly in front of it you are not able to access the QR code? Keep in mind that there are seats directly in front of the where the ad is so it would not be easy to get close enough in the first place. While it was a good idea to include the actual promotion URL, that is not something that most people will bother to enter in order to be enrolled in the contest promotion. In this instance my problem is as much with the way the QR code was depicted in the ad as the technology itself. If anyone can offer any example with verified statistics that show a positive ROI in using a QR code please do share it with the rest of us. I’m betting that there will not be many if any. This entry was posted in Augmented Reality, Marketing stuff, Technology, Uncategorized and tagged Augmented realilty, Near Field communications, NFC, problems with QR codes, QR codes, QR codes dying, What's wrong with QR codes. Bookmark the permalink.